Our main course for this Passover was a nod to one of the holiday’s less publicized but ever-present themes: the renewal of spring. This dish was envisioned as spring on the plate. The potatoes, of course, grew beneath the ground. The shredded beef cheeks, both in color and – to a slightly lesser degree – in texture represented the soil itself as well as the beasts that walk on it. The asparagus and the pea shoots, of course, represent the plants and produce emerging from the soil in spring time. And while this may be a great dish for Passover and for spring it ought not be limited to the Sedar table. Bake the Potatoes. Preheat the oven to 375° Fahrenheit. Wrap each potato in aluminum foil, place the potatoes on a hotel sheet and bake until they are pierced easily with a knife, approximately 30 minutes. Make the Potato Skins. Remove the potatoes from the oven and cut in half length-wise. Scoop most of the flesh of the potatoes out of the skins. Season the skins with salt and pepper, drizzle with the olive oil and scatter with fresh thyme. Return to the oven for ten minutes until just a bit crispy. Make the Sauce. Remove the beef cheeks and the vegetables from the braising liquid. Add a cup of good quality red wine. Reduce the braising liquid and wine by at least half to a sauce-like consistency. Add the balsamic vinegar. Make the Asparagus. Bring a pot of water to a boil and par-boil or steam the asparagus for five minutes. Be certain not to overcook the asparagus. Shred the Beef Cheeks. Shred the beef cheeks using two knives to pull in opposite directions, as if for pulled pork. Assemble the Dish. Place a mound of beef cheeks inside each potato skin. 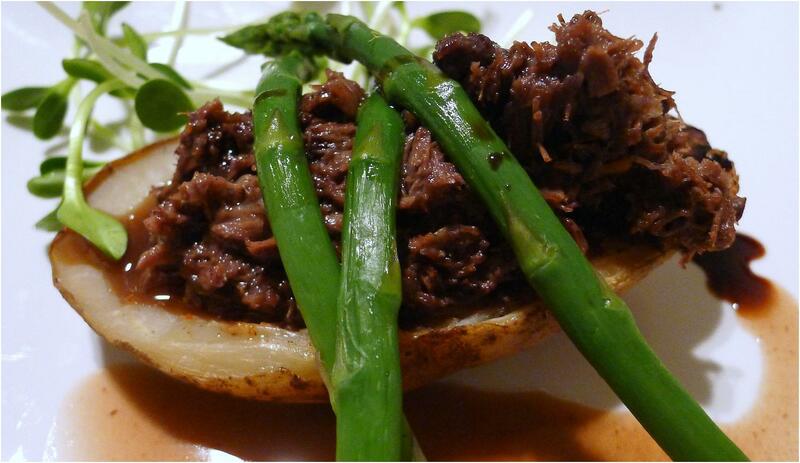 Arrange the asparagus and pea shoots as if shooting out of the beef cheeks. Spoon sauce over the meat, potato and plate. Drizzle the pomegranate glaze over the meat. This looks delicious. I’m a bit of a pagan Jew, so I love how you deliberately celebrate spring. A great refresh on a boring brisket! I really believe that it IS something that is implicit in the Haggadah and Sedar….